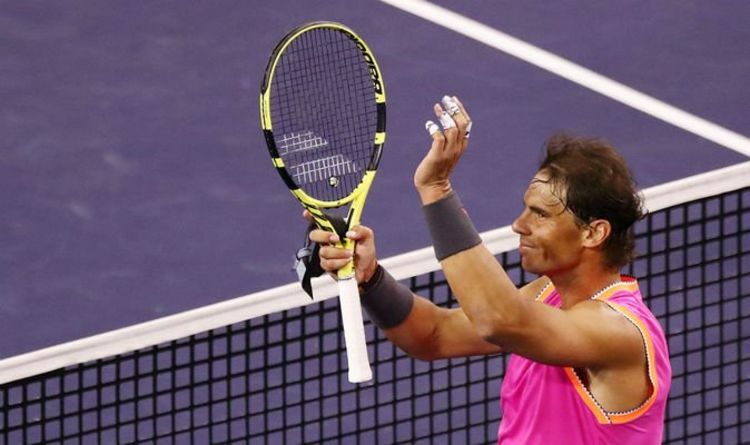 Nadal, a three-time champion in Indian Wells, broke Donaldson early in the first set and barely dropped his level as he gave his American opponent the runaround. The Spaniard won the opening set 6-1 and won seven consecutive games as he continued to dominate the match. And after a little over an hour, Nadal had wrapped up the win and sealed a place in the third round where he play Diego Schwartzman. Well done Donaldson. Incredible speed to reach a Nadal drop volley and flick a shot down the line which results in an error. He’s been well beaten but never given up. Point of the match delights the crowd as Nadal hits a remarkable overhead flick. Match point Nadal. GAME. SET. MATCH. Donaldson goes long with a volley and Nadal safely reaches the third round. A hold to 15 for Nadal. He has been all business tonight. Can Donaldson keep the match going? Donaldson’s makes just one of six first serves and it puts him in trouble once again. Break point Nadal, who is showing no mercy tonight. And a Donaldson backhand into the net puts Nadal in sight of victory. Nadal’s best service game of the match. Includes his fifth ace of the match. Donaldson isn’t getting close a break. BOOOM! Nadal smacks a 92mph forehand return winner past a stationary Donaldson, 30-all. Nadal goes long with a forehand and that leads to a nice applause for the American, who finally ends Nadal’s run. Nadal keeps his foot on the gas to win his seventh game in a row. Donaldson thinks he has the point won after a nice drop shot but Nadal speeds up to it and flicks a backhand past the American. Nothing is coming easy for Donaldson and Nadal gets a break point. But credit to Donaldson as he forces Nadal to go wide with a backhand. Second break point of the game for Nadal as Donaldson’s backhand drifts just wide. And other miss from Donaldson sees Nadal win his sixth game in a row. A third double fault of the set for Nadal. But he can always rely on his forehand to come to the rescue. And on set point, Nadal hits an ace to race through the set in just 33 minutes. Good response from Donaldson as he races to 40-0. But Nadal pegs him back to deuce. And the Spanish gets a break point with a brilliant volley. Double break as Nadal rifles a forehand past an advancing Donaldson. Nadal is shifting through the gears ominously. Nadal consolidates the break as he stretches Donaldson all over the court. The Spaniard catching the line with a forehand to take a nice lead. Nadal’s turn to go 0-30 up as Donaldson makes back-to-back forehand errors. But an ace and backhand winner down the line levels the game. The game goes to deuce and Nadal gets his first break point. And he breaks at the first opportunity when Donaldson can only put a volley into the net. A double fault to start for Nadal. And a forehand error makes it 0-30. But Nadal gets it back to 30 all. And he gets a game point when Donaldson makes a mess of a straight forward volley at the net. Good defence by Donaldson on the first point and he follows it up with his first forehand winner of the match. But Nadal responds with one of his brutal forehands down the line, 30-15. Another forehand winner for Donaldson makes it 40-15. And he settles any nerves with a third forehand winner to get on the board. Nadal is taken to 40-30. But a vintage wide serve followed by a big forehand wins him the game to start the match. 01:05: The players are out on court. Nadal is wearing a sleeveless pink top. 00:55: Roger Federer and Novak Djokovic are already safely through to the third round after good wins. Nadal will no doubt want to do similarly. 00:45: The winner of this match will play Diego Schwartzman in the third round after he beat Roberto Carballes Baena. 00:30: Hello and welcome to live coverage of Rafael Nadal’s opening match at Indian Wells. The Spaniard’s clash against Jared Donaldson is the first match of the night session.